It’s been awhile since I popped in on this little space. I’ve been pouring my energy into building my art business and creating new art. I’m grateful to have a chance to pursue this vision of seeing the beauty of our creator and reflecting it to others through my art. But I do want to use this space to encourage you during the upcoming holiday season and offer an alternative to the usual hustle and bustle that is looming ahead of us. So you may already know that I feel pretty strongly about waiting to acknowledge Christmas till after Thanksgiving, but that’s not entirely true. I actually start thinking about Christmas in late October or early November in the form of Samaritan’s Purse Operation Christmas Child Shoeboxes. In our household, we’ve replaced the stress and expense of finding and shipping the perfect gifts, making the fancy meals, and sending out millions of Christmas cards. Instead we go shopping to fill shoeboxes with gifts for children around the world. Don’t get me wrong, those other Christmas traditions aren’t inherently bad. They are a way for many people to show love to others. But for me they were just added stress. Call me a party pooper, but the traditions of Christmas can seem like distractions from what’s really important. Giving gifts to loved ones is nice, but when most of our closets are stuffed to the brim, do we really need to spend money on more stuff? We live in a culture where even the poorest among us has access to more than many people in other cultures. Not to discount the needy among us, but to remind us that there’s a wider world out there with children who may never have access to toys or hygiene products if we don’t reach out to them. Maybe it’s because we don’t have our own children to shop for that makes it kind of fun to walk the toy aisles and find the perfect gift. But really it could be an even more significant activity to do with kids because they could each be responsible for finding gifts for a child their age. It’s also a great opportunity to direct your children’s attention toward the joy of giving to others instead of perusing the shelves for more toys they want. If you’re new to the shoebox game, here’s a great list of useful (and not so useful) items to include and tips for packing a shoebox. Something new this year: you can no longer pack candy and toothpaste in the boxes because of customs. The coolest part of all of this is that it doesn’t stop at buying a gift for someone in need. It’s about Jesus. The children who receive shoeboxes are enrolled in The Greatest Journey, a discipleship program that shares the gospel with them. That’s really the point of Christmas after all. God becoming flesh and entering the world to live the perfect life we couldn’t live and pay the penalty for sin that we deserved. Emmanuel. God with us. The greatest gift of all. If you’ve been packing shoeboxes for years, consider making it the primary way you give gifts this year. Be intentional about where your money goes this holiday season and consider giving to those who really need it, whether it’s in the form of shoeboxes or another ministry. We usually give something from Samaritan’s Purse’s Gift Catalog in honor of our families members each year as well, but there are a lot of other similar opportunities to give that you could choose from. Join us in celebrating Christmas in October and head out to pack those shoeboxes! National shoebox collection week is November 13-17 so get a jumpstart on it this year and cross your Christmas shopping off the list! I don’t have a dining room anymore. Not there there was much of a dining room to begin with in this cozy little apartment, but what accommodations there once were for sitting at a table and eating are now gone. Why? You ask. The corner of our kitchen that should be used for eating is now my art studio. That’s right. It’s filled with paints, brushes, pencils, and baskets full of cards. I love this little space and the big window that lets in sunshine. It’s amazing how much can be jammed into a $16 Walmart shelf if one has the will. 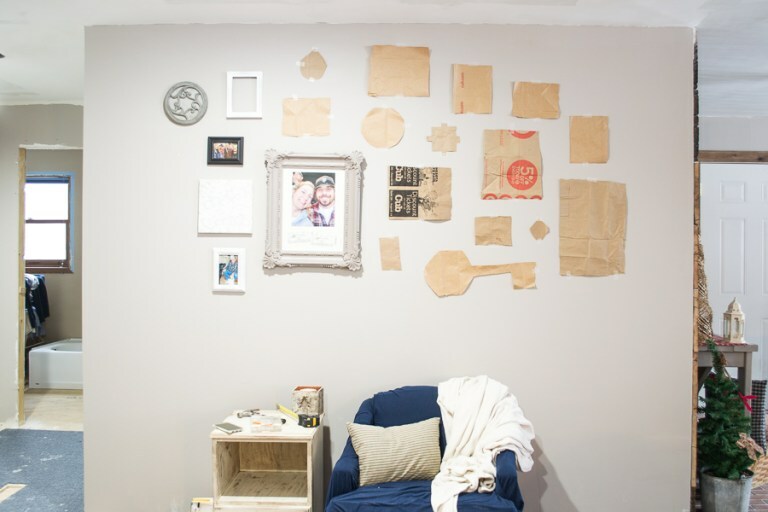 And the clipboard wall is in a temporary state of tidiness. We’ll see how long that lasts. Half the fun is arranging and rearranging supplies and displays. I’ve always drawn and painted my whole life, but since starting this journey of running an art business, I’ve really been working to perfect the craft. I’ve researched best products to use, taken tutorials, and read books. And of course, I practice a lot. I’m slowly adding to my house portrait portfolio. I love that people have special memories of places they’ve lived and trust me to help preserve those memories. I just added oil painting to my repertoire, and it might be my favorite medium yet. I love how bright and dimensional it is. I don’t use my easel the way most artists do; you know, to actually paint on. It mostly houses projects, ideas, and inspiration. Every painting is a bit of an experiment, and I see it as an opportunity to improve. Even though I’m a very goal-oriented person, I’m learning to see the value in the process and even the mistakes. My self-confidence ebbs and flows as I succeed and fail with certain paintings and ideas. I try to remind myself that the process is as important as the product. Sometimes a little snack is required to make it through the afternoon slump. I’m a night owl and come alive after dinner, but my most uninterrupted work time is in the afternoon, so sometimes I just have to push through. Let’s not forget about the storage and packaging corner of this apartment. Tucked in between my teaching supplies and Owen’s computer are all the boxes and art pieces ready to be sent out. We try to keep this disaster out of sight. You guys know about this floating shelf for rotating art, but I bet you didn’t know my hard-working scanner and art class supplies were right underneath it. I’m pretty addicted to organization, and there’s nothing that makes me happier than having a place for each little item. There’s your behind the scenes look at where I do what I do. It provides a little corner for me to see and share the beauty in life that points us to our creator. Thanks for taking the tour of my happy place! What is the True Value of What You Buy? I love freebies. I don’t care if I never use something or if a free printable sits in a folder on my desktop never to be seen again, the promise that something is free is so enticing to me. The internet has sold us on the promise of free. Blogs provide generally free content that’s new and exciting. Youtube can entertain us free of charge for hours. And why would anyone pay for a newspaper when they can google something and find out infinitely more about that topic essentially for the price of a wifi subscription? If I love FREE, it naturally follows that if I do have to pay for something, I don’t want it to be expensive. To a certain degree, I feel I am owed a good deal. If I can pay for something when it is discounted, why would I buy it at full price? I used to scoff at the high prices of fine art and wonder who would spend that much money on something they don’t need. Now that I’m running a business creating art, I realize how much time, energy, and financial investment goes into creating that final piece. Many artists and creators would probably make minimum wage if they were getting paid by the hour. Handmade products of any kind are more than the final product, they are the culmination of hours of labor. The thing is, there are people who will drop $4 on a coffee every day of the week and think nothing of it, but would never consider paying for something handmade that will last forever. It’s all about what you value. But it’s also about something gaining inherent value through the process that goes into creating it. I’m all for recognizing and acknowledging when something has worth and being willing to pay for that value. My thing is handmade soaps. I know I can go to Wal-Mart and pick up a two-pack of soap for a dollar if I wanted to, but the value that I get from a homemade bar of soap with all it’s fragrance and beauty is worth the $6 bar. I also know that a lot more goes into making that bar than into the manufactured one. There’s value in shopping handmade, and there’s also a lot that goes on behind the scenes that if we knew about it, we’d be willing to pay even more for a product or a service. I can’t make handmade soap, and so I pay other makers to do it for me. What I can do is paint. Maybe it’s not worth it to you to pay for my work, but you probably pay to put something on your walls (or maybe you like bare walls, but that’s another post entirely). My sister-in-law is a musician. I mean, she works full time doing amazing ministry work, but the music is inside of her and pours out of her in such a beautiful way. She would be a starving artist if she relied on her music (plus she’s amazing at her day job), because it’s hard to make it in the music industry. Not to mention, Pandora and other music sites beckon to us with their promise of FREE. Creatives do what they do out of a love and passion for their art, but they’re probably also working their butts off to compete with a world that offers many things for mere pennies. “Art rarely invites instant gratification. Just as Art takes time to create, and undergoes all sorts of transformations and revisions, in the process of being created, art needs to be responded to by countless re-seeings or re-hearings or re-readings. Art literally appreciates as we assimilate it into our lifetimes. Is the slow beautiful process of creating art inherently valuable to you? Does the re-seeing of it transform your life? Does it point you to something greater? Next time you want to give into the offer of getting something for free, stop and consider its true value. By paying nothing for it, you’re saying it’s worth nothing to you. Instead, find things of true value that will appreciate with time and understanding. It might not be an object, but a service or an experience, that highlights the process of creating. Let it point you to the ultimate Creator from Whom all beauty and art originated. It’s been awhile since I last popped in with a little life update (like here and here). The spring semester always seems to fly by for me, but this year I was battling sickness and the incessant winter so much that it’s seemed spring would never come. But the sun’s shining now, we’re counting down the last couple weeks of school, and a breeze is drifting in through the open windows, so I think that signals the light at the end of the tunnel. So pour yourself a cup of tea and let’s dive in! Around the beginning of the year, I hosted an art party at our apartment for some the ladies from our church. We enjoyed good fellowship and the chance to express our creativity. I love being able to share my love for art and beauty with others and I’m blessed to know these ladies. Right at the time I was about to give up on ever seeing spring again, I discovered this sweet little shop, Olive and Pearl. It was like stepping off the snowy street and into an adult’s version of Narnia (you know, after the white witch has been defeated): beautiful products, tasteful displays, charming bouquets, and lovely smells. I just found my new splurge store. I’ve started to find my groove sharing my art locally. I had a display at a coffee shop, the library, and the Art League in town. There’s something so much more personal (and sometimes scary) about sharing my work in local places. I love that we live in a town that appreciates art and beauty, and that supports artists. For better or worse, I’ve also signed myself up to sell at the farmer’s market, and I have some art fairs at the beginning and end of summer. There’s been a lull in the internet side of the business while I gear up for all of this. Here goes! I would be remiss if I didn’t talk a little bit about my other job – teaching. To end out our study of The Twenty-One Balloons, we had a balloon party. The kids brought in food from various countries to go with the theme of the book, and they created their own hot air balloons. It a unique experience to get caught up in a book and be able to share the adventure with others. I love that I get to do that with this group of kids. Over the Easter holiday, Owen and I got away for a little time together in the wilderness. What started as a two day backpacking trip turned into a stay at a historical hotel and a visit to the hot springs. We began with a hike to a secluded campsite in a canyon next to a little stream. We hiked the area and watched the sunset, then hiked out in the morning and headed to the Thermopolis hot springs. It was a wonderful time of reconnecting and enjoying God’s creation. If you haven’t figured it out from some of my posts (or haven’t seen all the books I own), I’m an avid reader. 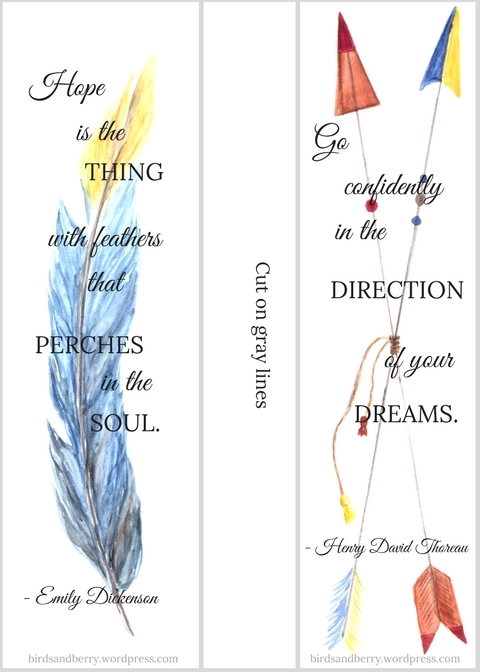 So I thought it was high time I created some bookmarks for you to use in your own reading life. Click on the image below and print from your browser. After I started my Etsy shop, I discovered that the internet if full of information about how to be successful. Much of it is very helpful. For someone like me who had no real plan going in, I have learned a tremendous amount about how to run an art shop and blog. It’s really kind of an amazing age we live in where you can learn almost anything with the help of the internet. But there’s something a little deceptive about a lot of the advice out there. The internet has a lovely way of editing out all the failures and condensing everything into quick little sound bites of information. Most of the advice you get about how to start a blog, business, or anything really, makes it seems like you will find success overnight. I’m calling their bluff. I don’t buy it. The one thing no one tells you about starting a business (or anything new for that matter) is that it will take time. As a self-proclaimed hater of waiting, I don’t want to hear this advice. I want to believe that the next big break will happen overnight and I won’t have to do anything to make it happen. But the truth is, it’s more than a few updated strategies, tweaks to a blog, or promotional posts that will build a successful business. Sometimes it’s years of hard work and perfecting techniques and learning and growing. To be perfectly candid, pretty much all of last year was a big experiment for me. I really had no idea what I was doing as an artist and blogger and I tried a lot of things that didn’t work so well. And I’m still trying to embrace the little victories, because it’s slow going. I realize a lot of people are more set up than I was to be successful. They had connections, were seen by the right people, had a really solid business plan from the beginning. But even with the best practices, it takes time to create something that has real staying power. This is true for any area of life. Sure, some of us have the natural ability to be successful at certain things right off the bat, but I bet even those people have things they have to work on. If it’s not small business, it’s parenting. If not blogging, job performance. There’s this false image that makes it seem like we can do it all and have it all. But it’s just that: tightly edited images that show one small snapshot of reality, but not the whole picture. Life is messier than that and takes a heck of a lot more work and patience. In an instant gratification culture, it’s really easy to give up when you don’t see immediate results. But whatever happened to words like “persistence”, “diligence”, and “endurance”? These qualities require time to develop. I still haven’t seen the kind of success I’d like, but I’ve seen growth, and right now that’s more important than success. And I trust that God is using all the small progress along the way to teach me patience and persistence. Take heart. If there is something you are trying to master but you just don’t see the results, keep at it. Keep working and trust that in time you will see the fruits of your labor. Whatever work God has given you to do today, give it everything you have for this day. You may not see the big picture or get there as fast as you want, but be faithful with today. Sometimes the slow process is just as important as the end result. Remember handwritten letters? You know, snail mail? Like actual cards that people wrote and sent in the mail? Even though I grew up during the age of letter-writing, I’ve almost forgotten that that’s an option anymore. We live in such an age of technology that we don’t even think to write letters on paper when we can send a text or a facebook message. It’s really a lost art. But handwritten notes can be a powerful thing. Owen and I communicated through cards, postcards, and little notes throughout college and even during our time apart. I’ve held onto all of his notes all these years as reminders of our early relationship. Texts just don’t quite have the same significance. Maybe it’s time to bring back good old-fashioned letter writing. I say this to my own conviction as I recently responded by text to a handwritten card I received (oops!). If you’re stumped about where to start, here are some ideas to help bring back the lost art of snail mail. There’s nothing quite as surprising or special as finding a sweet note in your lunch bag or tucked under your pillow. It can be a long list of the reasons you care about someone or just a simple “I love you”. I was raised to write thank you notes for every gift I received or special thing someone did for me. As a child I complied begrudgingly, but as an adult I see the value of expressing gratitude in written form. It takes a little more thought to put pen to paper and write the reasons you’re grateful, but it’s an important and beautiful practice. I’m a big proponent of care packages (especially where chocolate is involved). These are particularly great for the starving college student in your life, for long distance friendships, or to greet someone who has just moved to a new house or town. Tuck in a little note to say what they mean to you and that you’re thinking of them. Okay, this might be a little bit of a cop-out because it doesn’t require you to actually write a letter, but I’ve bought and received cards that were just so pretty I had to frame them and use them as wall art. Cards are the perfect size for filling the little spaces in gallery walls (one of my favorite decorating trends). I especially like looking out for pretty Christmas cards and saving them for decoration the next Christmas. It’s all part of #seeingthebeautyinlife. Sometimes there are things that no human words can say to comfort or encourage someone; that’s when writing the truth of God’s word can be the most powerful. Before facebook messages were a thing, I used to write long detailed letters to my long-distance friends. I always looked forward to receiving letters back. Now I’m lucky if I send a decent Christmas card. Maybe it’s time to revisit the days of pen pals and write real letters again. I used to love scrapbooking, but nowadays that seems like a complicated process for preserving pictures that are better kept digitally. But I still have a box of scrapbooking supplies that I use to create cards for baby showers, birthdays, and other celebrations. There’s something special about creating a note with a caring message that someone else can enjoy. I just found out that April is National Card and Letter Writing Month and thanks to Hallmark, there’s a whole calendar of ideas for writing letters for the month of April. You could really pull it out whenever you’re looking for inspiration. And call it a shameless plug, but I’ve got plenty of cards and stationery in my shop if you’re looking to restock your card stash. So go on out there and get writing! Let me be honest, when I first became a mother I truly believed if I just did what I was ‘supposed’ to do as a mom I could shape them into the well-behaved, perfect children I knew I was destined to have. The reality: they are their own little people, through and through. They are just born that way. Another thing I learned: there is no ‘supposed right way blue print.’ The way my parents did it may have no effect on the beautiful little monsters that bless my life. Let me back up. I was born to two amazingly loving parents who were young and not really prepared for a baby. I don’t know if anyone is ever really prepared, truly. But they were good people who knew how to work hard, taught us that if you work hard you can accomplish more than you ever thought, and they taught my sister and me what it means to have parents that love you. My mom always says, “the only two things a kid really needs is one, to feel safe, and two, to feel loved. We had that. My parents always encouraged my sister and me to pursue our dreams and be who we are at heart. That being said, I don’t know why I ever got the idea that being a parent was going to be easy and that, again, I had some major bearing on who they are. I have a bearing on what opportunities – good or bad – that I allow to be put in front of them. But they run the show of their own little life… and it is amazing! I have a son, 10, and a daughter, 8. They could not be more different little people. I’d like to blame my husband for some of their quirkiness, but he is often just as baffled as I am about where their little personalities came from. My son doesn’t have a shy bone in his body. We would go to the zoo when he was 2-3 and he would make best friends with some random kid. I would end up having to walk the rest of the day with a complete stranger because he refused to leave his new best friend. This was honestly painful for me seeing that I am a bit of an introvert and small talk with this kid’s grandma was killing me. He is an amazing kid and I am envious of his infectious, likable attitude toward life. My daughter is the complete opposite: she’s always a momma’s girl and wears all emotions on her sleeve. And she has emotions! She is moody and tries every ounce of patience I have as she is the most stubborn person I have ever met! She has massive amounts of separation anxiety, yet does the announcements at school for the whole student body to hear. I can’t keep up. Her heart is the size of Texas and she shows all sides of it. I ask her, “where did I get you?” She replies, “from God.” She says it like, duh mom! I love her and her fiery personality. A couple months ago, I felt that we needed some sunshine. My hubby was not yet home from work and it was just me and the kids and a nice day. Sometimes I love just seeing where their little personalities will come out. It’s unpredictable and fascinating. I gave them each a camera and told them to take some great pictures they could use as inspiration for their art projects. Art is the one thing I have tried to always have around them. It’s an expression of our most inner parts and I think it’s good therapy even for kiddos. We left on our walk and I was anxious to see what direction they would go with their pictures. Mason had a very deliberate straight-forward approach to his pictures. McKenna wanted a full story. She wanted me to take the pictures of her posing here, posing there. She is such a ham. The pictures were meant to inspire her. It turns out I was the one who was inspired. I felt like the time I spent with them both that day totally exemplified their personalities. Art is emotion and that day ‘my cup runneth over’ as they say. I had to paint my daughter just as she was – silly, sweet and all heart. This painting I did in two sessions. I am more of an illustrator at heart. Despite art lessons and tutorials that tell you otherwise, I start with a pastel drawing. I am also a figure painter, so highlighting the most important part that I want to be the focus is always first. In this case, it was her face. That took one session and then the more loose background and such took another session. I think it may be one of my favorites. Emotion is the driving force behind all enjoyment of paintings. If we didn’t care about that aspect any ol’ painting from the dollar store would be fine to hang on our walls. But our love for what the painting represents is what makes it into a real work of art in our eyes. This painting might as well be my heart on the canvas. There is no making these little monsters into the people I thought they should be, I wouldn’t even dream it. God sent them here far more amazing than anything I could tried to make them. Y’all, how amazing is Shelby’s art? I love to hear her heart behind this stunning piece. You can see more of her work over on her website Shelby at Home and on her Instagram and Facebook page. And as a bonus, here’s a Leaves in the Wind Process Video so you can watch the mesmerizing work in progress. If you’re like me, you might find it’s easy to become distracted by everyday worries, responsibilities, and beeping notifications that constantly vy for your attention. The whole “stop and smell the roses” thing can become nonexistent in our lives. And yet, it’s oh so important. I wrote a couple of weeks ago about the reason I’m doing what I’m doing; about my desire to point others toward beauty, and about how what we see changes us. This pursuit might seem superficial, but I think there are hints of Eden all around us; traces of God in the ordinary. Slowing down to notice them is the only challenge. So I’m offering a few simple ideas to take to heart when seeking beauty in the unexpected places. There are a lot of beautiful things we can see on the internet or TV, but nothing compares to seeing those things in real life. Instead of looking at your phone while you’re waiting in line, seek out something worth looking at: the flowers at the grocery store, the cute little baby in front of you, the pictures on the wall at the dentist office. You might even have to look closely, but don’t miss what’s right in front of your eyes. Try leaving your phone at home and going for a walk (I’m dating myself, but remember the old days when we couldn’t even imagine taking a phone with us outdoors? And now we panic when we accidently leave it behind.) Power down for a while and enjoy what’s around you. Resist the urge to capture it on camera and truly see the beauty. You don’t have to be an artist or take beautiful photos to to create something worth looking at. Even a well-prepared meal or a clean house has beauty in it. Sometimes it’s worth it to pull out the paints, markers, or colored pencils and just start creating something. It doesn’t have to be a masterpiece to be beautiful. Just looking at pretty colors and exercising your creative muscles is worth it. It’s easy to take for granted the pretty things in our daily lives, but sometimes a change of scenery can be the very thing we need to see things differently. It might be an exotic trip to a beach resort, but it can also be as simple as stepping into a boutique you’ve never visited before or driving into the wilderness. Art museums are also great for this (especially for the self-professed artists like myself). Leave the camera behind and pay attention to each little thing along the way so you can take mental photographs to capture the memories. Your own imagination can be full of untapped beauty.The very best books paint pictures in our minds. I’ve mentioned it before, but I’m a big fan of reading. I love to get lost in a story or be transported to another place. Words are as important as images and can be even more powerful. And they can communicate beauty in a vivid way. Search for beauty in the books you read and for heaven’s sake, ditch the books that are full of ugliness and lack redemption. A beautiful story told with well-chosen words in of infinite value (I mean, just look at the bible). It’s so easy to get caught up in the mundane routines of daily life and lose sight of the beauty around us. There’s value in looking up from the ever-pressing daily needs and pausing for a moment to appreciate the little things. Pick those flowers and enjoy their beauty, open the curtains so you can see the sky, listen to classical music while you wash your dishes. Fill your mind and heart with what is truly important. Just a reminder, I would love to see the beauty you are finding as you journey through this life. Whatever it is that captures your attention, share it on Instagram or Facebook with the hashtag #sharingthebeautyinlife. Let’s share the beauty we see to point back to our creator. One of my favorite things to notice and appreciate is birds. Aside from just being pretty little creatures, they are a picture of God’s care for us. I created this graphic as printable for you guys and a reminder that God’s love spans all of creation.